OtoSome - Understated luxury is not only presented on the look out Toyota Kijang Innova second generation. Search results editorial crew of close during a visit to Toyota's headquarters in Toyota City, Japan, last October, the cabin part of the equation gives the feel of an exclusive VIP style. When entering the interior space, direct eye fixed on the dashboard design is luxurious and very different from its predecessor. In the middle of the dashboard there is a monitor that serves as the head unit complete with a variety of the latest multimedia features. Many new buttons in the wheelhouse. 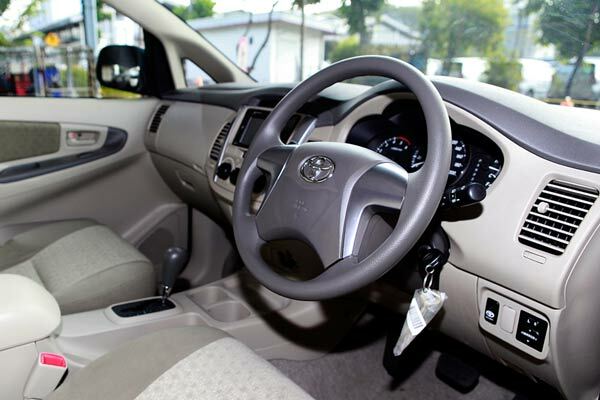 Among others, cruise control lever behind the steering wheel, the eco button and power modes, as well as smart phone connection. Seat using different motifs (side and central) and feels soft when occupied. To the rear passenger seat models available individually (captain seat) complete with armrests. Behind the front seats there is room to put snack and beverage cans. In addition to giving an impression of space can also be used for access to the third row. Even among the captain seat there is a place to put a glass or cans of cold drinks. While sitting in the second row, new scenery visible on the roof. Average ceiling because there is no longer a niche that is used for the LED that serves as a cabin illumination. Low-intensity blue light to give the impression of a cool and classy. There are also controls the cooling (air conditioning) back room complete with a neat hole.